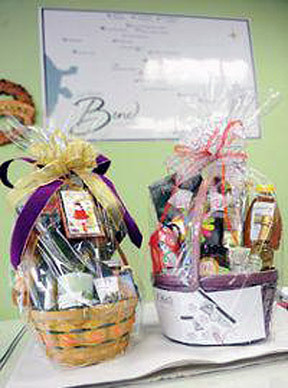 The baskets from the 2011 shop hop. Photo courtesy of San Benito Bene. Psssssssst. Have you heard what's happening this Saturday, December 1? It's the 2012 San Benito County Holiday Cheer Shop Hop. Whooo-hooo. Eighty-eight (88!) shops, restaurants, galleries, artisans, services, salons and spas, agriculturists, and nonprofit groups throughout the county are taking part in this second annual event. 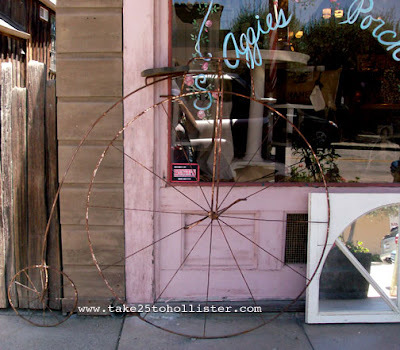 We're talking 88 local businesses from Hollister, San Juan Bautista, Tres Pinos, and Aromas. These 88 local businesses have generously contributed items that shoppers have the opportunity of winning by entering their name at each business they visit on Saturday. The Holiday Cheer Shop Hop organizers are creating 15 (15!) lavish baskets that may include products such as chocolates, wine, olive oil, note cards, and lotions, as well as gift certificates to restaurants, shops, spas, financial services, and so on. Some businesses will also be raffling their own basket of goodies, so you never know what you may find. By the way, did I say it is all free? Yep, it's free to enter for a chance for one of the 15 awesome baskets. No purchases necessary, but hey! you never know what you may want or need to buy for yourself and others. And, like wise mathematicians out there might say, your chances of winning increase with each additional business you visit. So, here you go. The list of the many local businesses to hop to this Saturday. Going from north to south, these businesses are located between Fourth and South Streets. 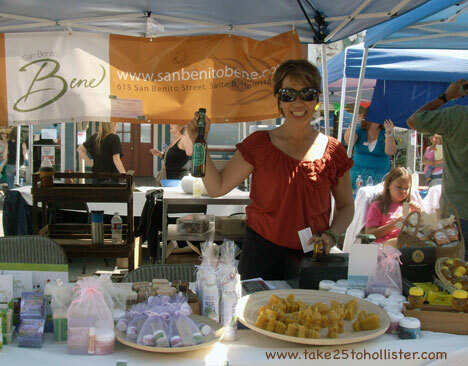 Pallacio Day Spa, and San Benito Bene are located at 615 San Benito Street. The following businesses are northeast of downtown. 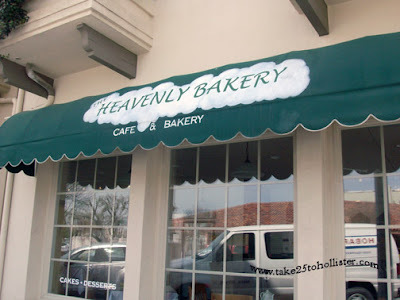 Both are near Fallon Road, which runs between Fairview Road and San Felipe Road (by Hollister Business Park). Some of the shops in San Juan Bautista share the same building. You might find info about some of the shops listed below at the Shop San Juan! Web site. The shops are listed in order from south to north. In other words, you're entering from Highway 156 at the traffic lights. Tresor Boutique and The Last Stitch Quilting Design Studio and Gallery are at 107 The Alameda. Rare Light Gallery and Visions of Christmas are at 108 B Third Street. Paloma Paloma and Season's Handcrafts are located at 203 Third Street. For more information, contact kathina@sanbenitobene.com or call her at 831-638-1188. The 2012 Lights On Celebration Parade was last Saturday (November 24). It was a perfect evening—just enough crispness and bite in the air to think yep, the holiday season is upon us. 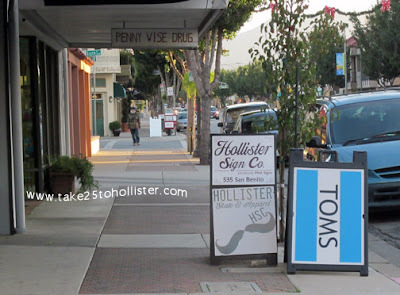 Thank you, Hollister Downtown Association, for another wonderful job planning, organizing, and making the parade happen for us all. My most favorite parts in the parade were the kiddies pumping away on their tricycles decorated with lights. It made me wish I was just as young as them so I could pedal a tricycle along the parade route. I thought one of the coolest-of-cool floats was Save Mart's entry—a gigantic shopping cart. What was your favorite float or part of the parade? Maybe next year, the Husband and I will think about getting down there early enough to put up some chairs. We drove down San Benito Street earlier in the day and saw chairs set up along the curb all the way down to Hawkins Street. And, maybe next year, I'll have a camera that can take clean, crisp photos at night. 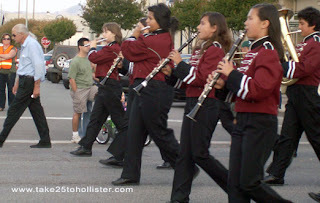 I've put together an album at the Take 25 to Hollister Facebook page of my better shots of the parade. Here's the link. Enjoy. 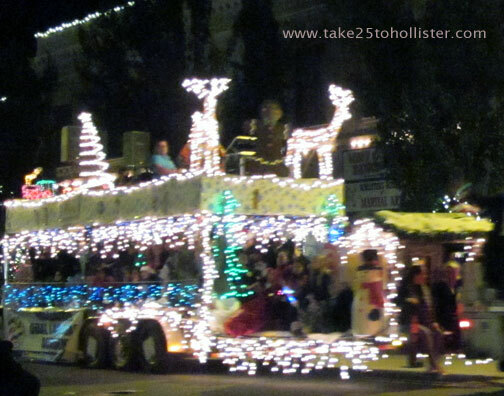 This year's Lights On Celebration is this Saturday, November 24, in downtown Hollister. Are you ready to have some fun? The event starts at 10 a.m. and goes on until 8 p.m. Activities are planned at the Veterans Memorial Building and at the North Pole (the lawn at the corner of San Benito and Fourth Streets). There'll be a variety of performances throughout the day by bell ringers, dancers, bands, and others. The Jaime's Toy & Canned Food Drive Car Show is on from 10 a.m. to 2 p.m. The entrance is at Brown Alley and Monterey Street. Cost of admission is a new toy (unwrapped) or canned food. 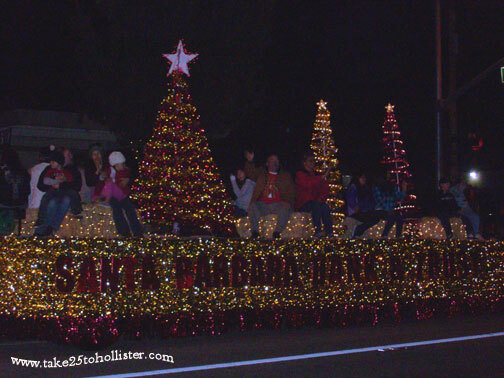 At 5:30 p.m., the Lights on Celebration Parade will make its way down San Benito Street. Whoo-hoo. 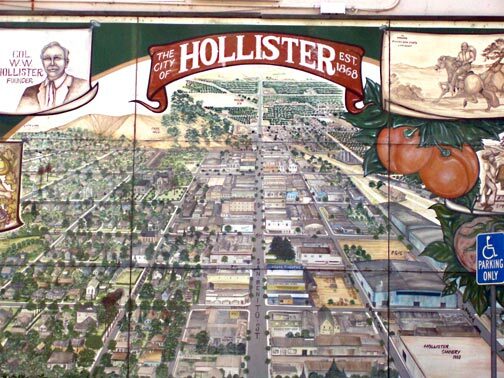 To download a schedule of events, head over to this Hollister Downtown Association page. If you'd like to see photos from the 2010 and 2011 parades, head over to the Take 25 to Hollister Facebook page and click on the albums. Yesterday (Sunday) was the annual Veterans Day Parade through downtown Hollister. It was a beautiful day to pay tribute to the brave and generous men and women who served in the U.S. military forces. To see more photos of the parade, click here to go to the album at Take 25 to Hollister's Facebook page. Just in case you haven't heard, here are three events taking place this weekend. On Saturday afternoon, November 10, children and their parents (Moms and/or Dads) can participate in a hands-on art project event at the Blak Sage Gallery (727 San Benito Street). The free event is from noon to 5 p.m. Cookies and tea will be served. The fun family affair fete is sponsored by the San Benito County Arts Council. For more info, call 831-636-2787 or check out this Facebook link. The Pacific Brass Band will hold its 12th annual benefit concert this Saturday, November 10, 2 p.m., at Rancho San Justo Middle School (1201 Rancho Drive). This British-style brass band is composed of musicians from San Benito, Monterey, Santa Cruz, and Santa Clara counties. The concert is sponsored by the local YMCA and Mr. O's Save the Music Drive. Proceeds of the concert will benefit the Hollister elementary school music program and the Hollister middle school sports program. Admission tickets: $25 per family (up to to persons), $5 for seniors, and $5 for students. Children 12 and under are free if accompanied by paid adults. Tickets may be purchased before the concert at the YMCA of San Benito County, Mr. O’s Academy, Postal Graphics, and Ace Hardware. 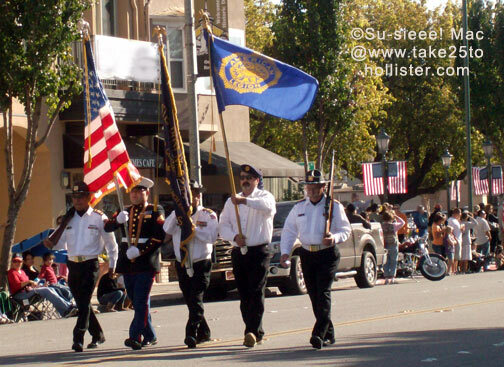 This year's Veterans Day Parade will take place in downtown Hollister on Sunday November 11 at 1:30 p.m. The Veterans Day celebration will begin at 11:11 a.m. at the Veterans Memorial Building with a moment-of-silence observation for our deceased Veterans. A BBQ lunch will be available at noon. The day's event will also have a resource fair for Veterans. A military flyover is slated to take place before the parade. 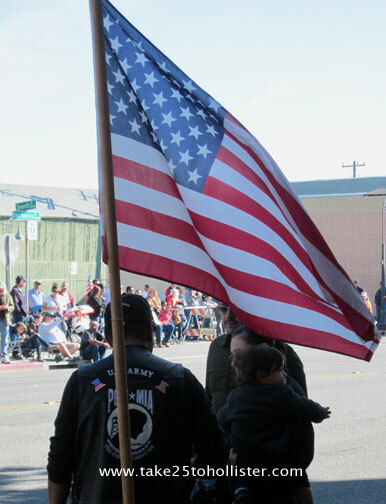 Scheduled earlier on Sunday is the annual Veterans Day Breakfast, hosted by San Benito County LULAC, at the San Benito High School Cafeteria. Breakfast will be served from 7 a.m. to noon. State Assembly member Luis Alejo will be a guest speaker at the breakfast. Breakfast is $8, with proceeds benefiting the 2013 LULAC scholarship fund. For further information, call 831-673-1977. 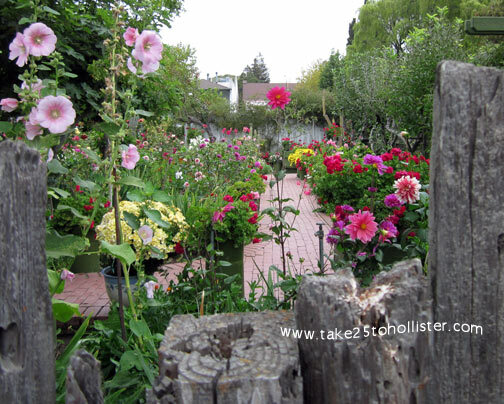 Whenever I walk down this part of Fourth Street in San Juan Bautista, I have to stop and gaze at this flower garden. I think it's part of the Jardines de San Juan restaurant.